Stories that offer a glimpse of immigrant experiences have always appealed to me. Most books I have read on the theme to my children are ones I picked purely based on a whim. Lee and Low, an independent publisher with a mission "to meet the need for stories that all children can identify with and enjoy." , whose books on diversity are an absolute favorite in the household. 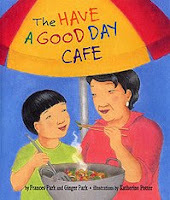 One of their books, “Have a Good Day Café” captured my attention during a trip to the local library. Mike’s Korean grandmother has moved to the States recently. She is bored and misses her life in Korea. It often pains Mike to see his grandma feel lonely and sad in the apartment, sitting all day long, yearning for her Korean life. While she is adjusting to her new home, Mike teaches her English. She also engages herself in the kitchen cooking delicious Korean dishes. Having experienced most of this first-hand whenever my parents visited the States from India, my children could immediately relate to Grandma’s feelings and experiences in a new land. Early each morning Mike and his family drive to the city with their food cart. The food cart sells a range of American foods - bagels and orange juice for breakfast, hot dogs and pizza for lunch. Being resourceful, she is eager to contribute to the family in a positive way. Grandma decides to join the family as they set up their food cart on a busy park corner every morning. While Mike spends time drawing pictures, Grandma often fans herself resting in the shade, reminiscing over her life back home in Korea. After a while, business starts slowing down when two more food carts start to sell pizza and hot dogs by the street corner. Mike’s parents are worried about their food cart business and are almost on the verge of quitting. Just in time, sharp-witted Mike comes up with a wonderful idea. He and grandma wake up early the next day and start making Korean foods and surprise the parents with a completely revamped menu. He also draws a sign on the food cart calling it “Have a Good Day Café”. Business starts picking up, and eventually proves to be a success. The gentle story offers a neat glimpse into the lives of elderly immigrants. The book turned out to be a very meaningful read, giving me an opportunity to discuss with my children, so many things specific to Korean culture, their foods and traditions. Also, in general, it opened a forum to discuss with them various issues immigrants face including families like ours that live far away from grandparents. We could instantly connect with Mike and grandma. Names of Korean foods are interspersed throughout. The glossary of words, definitions and pictures included in the end is a real neat icing on the cake. Simple illustrations done with soft pastel balance the uncomplicated text. The special relationship grandma and Mike share are captured beautifully through the creative pictures. Oozing with warmth, the book is a celebration of the ingenuity of old people, especially grandmothers - an aspect common to cultures all over the world. True, Prabha, grandmothers are the best! A great pick, and a great review. A and I had recently been to a performance by Korean artists 'A tale of Haruk'. It was the first time we had experienced anything to do with that country, and came away overwhelmed. It always strikes me that we miss out on so many wonderful creations of so many different cultures due to a lack of knowledge of their language and traditions. Hopefully many more such 'culturally unique' books will bring the world to us. In a mini way, we, too, have been immigrants, uprooted from the world we knew in another state, and settling in a state with a completely different language. We are slowly assimilating, but once in a while certain foods that mother makes, or some different way of celebrating a festival reminds us of it. Praba, nice pick. I can it is food time now in CROCUS! "Oozing with warmth, the book is a celebration of the ingenuity of old people, especially grandmothers". Awww. That is cute! I love Lee and Low books too, and one of my picks is also published by them. I am hearing so much abt Lee and Low books. See, one can always learn something new. Praba, you have touched on a lot of things we immigrants can identify with. 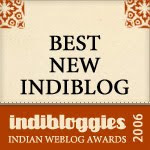 I so enjoyed this story and your review Praba ! Such a warm tale and what a nice way to learn about another culture ! We should definitely lay our hands on this to make the kids find answers to all those questions that come up when grandparents visit! The story seems very appeasing and positive and might effortlessly strike a chord with the young. Thanks for this pick P!! we'll love this book, for sure with so many elements in it we can relate to. added bonus - Korea which is special to the 5yo because of an interest sparked by one of his teachers. Thank you for highlighting each of the individual elements separately. Perfect book and a lovely story on the issue of elder immigrants. I remember, how my mother used to feel over there.